A very local walk around Appley Park using some Earth Walk series activities to get in touch with our surroundings in interesting ways. A walk that will take people through the mysterious lost village of Wolverton discovering the stories and lore surrounding it. A family seaside story walk with storyteller Sue Bailey. There will be plenty of stops for stories and finding beach treasure. Find out why the crab has no head, or why the sea is salty. Wear suitable beach shoes! A special walk to celebrate May Day and the New Carnival Company’s, free event “All along the Riverbank”. Admire Shanklin’s panoramic coastal views, Chine, Old Village and hills whilst discovering its volunteer community aspect, all with a hint of history. Refreshments will be provided at the Victorian Shanklin Theatre, one of the town’s greatest volunteering success stories. Bear has been stolen. Who could be so wicked? And where is he now? Listen to stories, solve riddles and follow clues to help Sue-the-storyteller find her teddy bear in this outdoor story treasure trail along the seafront at Ryde by Appley Tower. 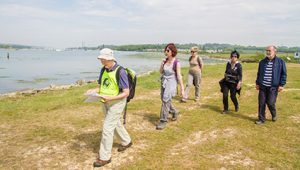 Join our Travel Ambassadors on a leisurely walk from Ryde to Quarr Abbey, one of the Island’s most peaceful and serene attractions. The route is flat, off-road and ends with the opportunity to be wowed by a fascinating monastic history. A look at Shanklin Cemetery (inc. Eurydice Memorial), some lost buildings and other features en route to the Railway Station. 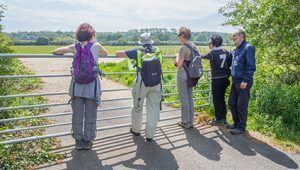 A circular walk to look at the conservation work and wildlife on the Hampshire & Isle of Wight Wildlife Trust nature reserves at Sandown Meadows and Morton Marsh. For adults who would like to find out more about the Nordic Walking technique. Session held on Bembridge Community Recreation Field. You will be taught the correct technique and the benefits explained. Poles supplied. Max 10 people. A leisurely amble around Pig Leg Lane Nature Reserve – a green oasis in the Ryde and Monktonmead Brook – the disappearing river. A circular walk taking in the Hampshire and Isle of Wight Wildlife Trust Martins Wood nature reserve and surrounding countryside. Starting at Shanklin bus station, the walk takes you down the east coast of the island, with views looking down onto Shanklin, Sandown, Bembridge and the airport. You’ll also be able to enjoy a panoramic view from the top of Culver down, before continuing the walk down towards Bembridge. A lovely accessible walk from Binstead to Quarr Abbey past the old Abbey ruins, along a quiet lane. Can be walked there and back or catch the bus back. Refreshments can be purchased at the Abbey cafe. Join our Travel Ambassadors on a leisurely walk from Ryde to Quarr Abbey, one of the Island’s most peaceful and serene attractions. The route is flat in parts but does have some inclines. It is off-road and it ends with the opportunity to be wowed by a fascinating monastic history. For adults who would like to find out more about the Nordic Walking technique. Session held on Bembridge Community Recreation Field. You will be taught the correct technique and the benefits explained. Poles supplied. Max. 10 people. Find out about the world of Himalayan Balsam control. If the plants are high enough you can join in. If not, we will tell you all about the Eastern Yar – it’s a lovely evening stroll along the river anyway. A walk through Brading Marshes along much improved footpaths with a stop at Bembridge Windmill. Join IOW Long Distance Walkers Association on their annual three day walk round the Island. A scenic walk through two nature reserves with possible sightings of red squirrels and bird life, insects and wild plants. The walk will be followed by tea & cakes! This wildlife spectacular gets you up before sunrise! So set your alarm and come and join us for one of nature’s great treats. We’ll hear from a host of resident and migrant songbirds (and there’s always the chance of a nightingale!). This walk explores Ryde’s rapid Victorian development from two small villages into a fashionable ‘period’ town: seaward facing villas with large gardens, parks, squares, churchyards, and the Esplanade with its promenades, flower beds, bandstands and boating lake.